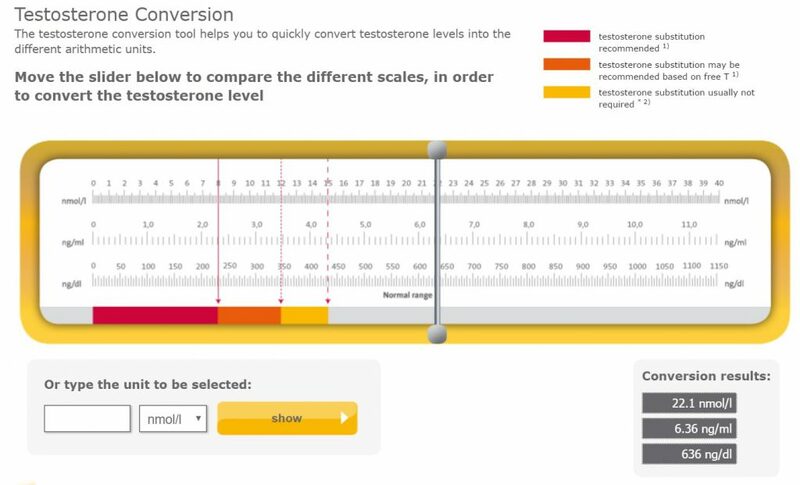 Check out this awesome online tool that helps you to quickly convert testosterone levels into the different arithmetic units. It’s basically a flashy calculator for converting testosterone level units. This is extremely helpful as a lot of labs and doctors use either the one unit (nmol/l) or the other unit (ng/dl). 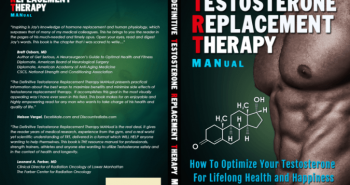 This handy tool also shows the different ranges for determining whether your levels are normal, or may require you to seek Testosterone Replacement Therapy treatment. On top of that, it also includes a Free Testosterone Calculator as well as a Management Tool/Quiz for determining whether you should seek treatment or not. This is great ammunition for making your case to the doctor – especially if they decline treatment despite your levels being in the low range. If you are having issues with getting treatment for low testosterone, I highly suggest showing this tool to your doctor or endocrinologist. The stronger you can make your case, the better! Click Here For The Awesome Testosterone Tool on the Nebido website. Quick Disclaimer: This tool is clearly developed by a producer of testosterone used in TRT, so you would expect there to be a little bias towards treatment in this case. However, I have compared the ranges they recommend to the average levels of men as they age (see the image below), and they seem fair and realistic. 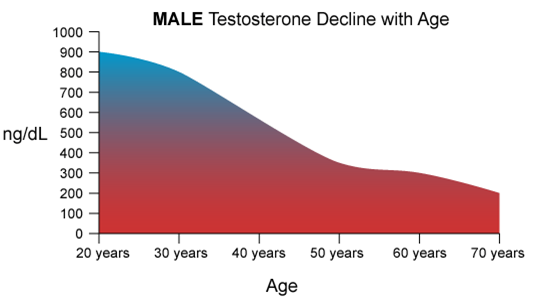 For more on Testosterone Levels and what the normal ranges are, check out my video on YouTube called Testosterone Levels – Everything You Need To Know. Next postThe TRT Manual And Facebook Group Access Is Now FREE. Firstly, congrats on starting treatment. That’s the first step. Typically, the injections are more effective and convenient, as you have more control over the dosage and you don’t have to worry about the gel rubbing off or coming off due to water/sweat exposure etc. That being said, the way to measure the efficacy of the treatment is whether or not your symptoms improve or not. If they do, then that is “effective”. Each treatment protocol is specific to the individual’s needs. If it works for you, no matter what the approach, then that’s the most important thing. If not, then feel free to investigate other options. Hi Lorenzo. Some testosterone gels have specific application sites, while others are more liberal where you apply them. I would stick with the sites recommended by Testogel or your doctor, at least in the beginning when you are starting treatment. Snappiness in the beginning is normal. How are the rest of your symptoms that you used to experience? That is the true determinant of whether the treatment is working or not. The links in the article have been checked and should still all work. I had never seen the “slide ruler” version of this calculator–thanks for pointing it out. There are a few other calculators out there that uses either the same algorithm as this one (Vermeulen’s) or that uses a non-linear calculation that may be more accurate when testosterone levels are farther away from the “normal range” (which the linear calculator is fine for). I found this tool at https://tru-t.org and have started using it as well. Thank you for this link. It’s another nice little tool!